Jay Z may have waxed himself into hip-hop immortality with “99 Problems,” but Sen. Cory Booker (D-N.J.) is drowning himself in 99 selfies. Somehow the New Jersey-bred genie has maneuvered his legendary social media savvy into political Similac for bipartisanship. Driven either by a pitch for Guinness World Records or genuinely convinced that he can single-handedly achieve Washington comity (“where no man has gone before”), Booker busily speeds through Senate hallways on a personal magic-bus tour to take selfies with every last one of his lawmaking colleagues. Booker, 45, gets an A for attitude where illusions of idealism won’t do. No one, least of all Booker, expects random acts of kumbaya on the Senate floor, or for normally noxious, disconnected legislators to suddenly launch into a Soul Train line. But it’s creative and perhaps … presidential? While he’s barely at 50 percent in a statewide Rasmussen matchup with an obscure Republican challenger who barely has $90,000 in the bank, Booker—strange as it sounds—keeps popping up in polls as a 2016 Democratic presidential primary contender. Obviously, the horse race prognosticators keep putting their bets on Hillary Clinton as the nominee. But there’s Booker in the back of a crowded field from 1 percent in February to 7 percent in June Public Policy Polling surveys measuring Democratic hopefuls. It could be that a basement Booker machine pulled a few strings to put him in the lead as a vice presidential pick (because Hillary just wants to deal with another smart-alecky brother like she wants a hole in the head, right?). He may have to battle Housing and Urban Development Secretary and Latino first-act Julian Castro, but it’s much more plausible that Booker’s a better shot by 2020 (should a new incumbent mess it up that bad) or 2024. The challenge: Booker doesn’t know how to sit still. So maybe he runs for governor first, instead. It may seem like the political odd couple of the ages, but the centrist liberal from blue New Jersey keeps making play dates with the red-state Kentucky libertarian who is, at the moment, dominating the Republican 2016 presidential primary pack. If Booker isn’t partnering with Paul to stop federal arrests of medical-marijuana users in pot-legal states, he’s building a Record Expungement Designed to Enhance Employment Act, or REDEEM, to help felons regain eligibility for government benefits. Paul probably thinks Booker is a gateway to disenchanted millennials on the fence about Democrats and—maybe—a few younger black voters who weren’t alive when Bill Clinton was president. But here, Booker is also making a few smart plays, aligning himself with the King of Libertarians in a quiet bid to win them over as a constituency for future moves. Maybe he cozies up enough with Paul to get picked as veep. Sound crazy? Look no further than 2004, when then-Sen. John Kerry (D-Mass.) seriously talked with Sen. John McCain (R-Ariz.) about joining his ticket. Not to be outdone, McCain turned around and was absolutely giddy to get his main man Sen. Joe Lieberman (I-Conn.), a former Democrat, on his 2008 ticket—until Republican operatives blew that idea up and picked her royal wackness Sarah Palin instead. At the very least, Booker wagers he could have a powerful friend in the White House in the next few years—and it won’t be Gov. Chris Christie (R-N.J.). Booker Isn’t Getting Much Done, but Who Cares? 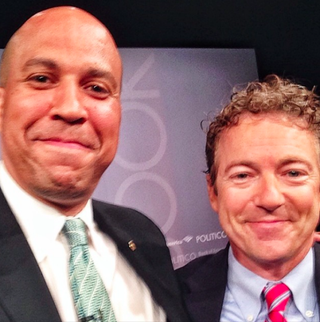 Booker might be snapping selfies and building Legos with Paul, but he hasn’t really done a whole lot of legislating. That’s not such a bad thing, though. Booker is playing this like a man who won’t be hanging in the Senate for too long, itching to break out of D.C.’s most prestigious senior citizens home. It’s similar to then-Sen. Hillary Clinton (D-N.Y.) pre-2008 and slow breakout sensation Sen. Al Franken (D-Minn.), who has quietly leveraged his way into influence—and kind of like that guy sleeping in the White House now.